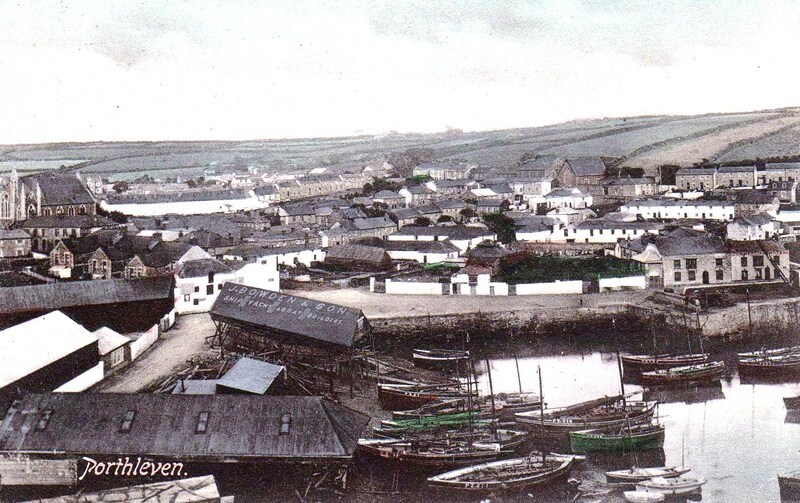 This story is about my great-grandfather John (Jacky) Bowden and his brother Thomas running a boat building business in Porthleven in the 1880s. It is about difficult times, successful Cornish emigration to Australia and misfortune at home. Then there is a re-union in Australia in 1989, and a description of the situation today. 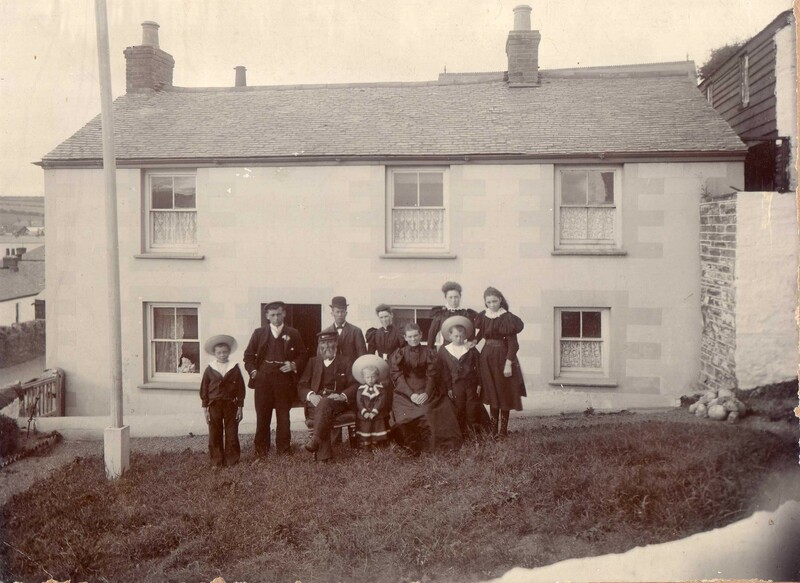 My paternal great, great grandparents, John and Jane Bowden, lived on Breageside, in Porthleven. He was a fisherman (born in 1811) and they had eight children: William born 1836, Eliza 1840, Jane 1842, Mary 1844, John (Jacky) 1847, Thomas 1853, Elizabeth 1855, and Ann 1858. William became a fisherman and his son, also William, emigrated to South Africa in about 1900. Eliza died young. Jane married John Bowden and Elizabeth married William Broad. Mary Bowden married Robert Marshall, a Scottish Master Mariner, and they emigrated to Newcastle in NSW, Australia, in 1880. Mary took her children and her sister, Ann, with her and Ann settled in Adelaide in South Australia. Sadly, their husbands died young but that is another story. Jacky and Thomas became shipwrights and started a boat building business together with their building yard at the head of Porthleven Harbour on the eastern side next to Richard Kitto’s yard. They built a number of fine vessels: Two pilchard boats for local use in 1866, a 48ft keel mackerel driver named the “Kingfisher” in 1878. But times were very hard in the boatbuilding trade at that time with a lack of orders and great competition. Thomas Bowden (born 1853) working on a boat frame c. 1880. In 1869 Jacky Bowden married Elizabeth Ann Pascoe and their first child, Ellen, was born in 1870, followed by Margaret Pascoe in 1877, and Thomas John Marshall (my grandfather) in 1881. Meanwhile Jacky’s brother Thomas was courting Martha Eddy. They decided to marry and emigrate to Australia and Jacky agreed to buy his brother’s share of the business for £120. Then came the parting of the family in 1883 when Tom and Martha sailed off to Australia, never to return. Jacky and Elizabeth Ann Bowden had three more children: Janie in 1885, John Warwick in 1888, and George the youngest in 1890. Sadly, Elizabeth Ann Bowden died in 1896, and Jacky later married Mary Ann Thomas. The J. Bowden Boatbuilding business continued and some sturdy vessels were built including the 49ft mackerel driver “Agnes Weston” which was launched in 1886 and a 35ton cutter the “Sea Breeze” which was completed in 1898, In 1899 Jacky formed J. Bowden and Son thus bringing his eldest son Thomas John Marshall, aged 18, into partnership. Jacky is seated wearing a peaked cap with his second wife Mary Ann (Thomas). The family from left to right are: son George, eldest son Thomas John Marshall, son-in-law Richard Thomas, daughter Ellen (married to Richard), daughter Margaret, son John Warwick (in front) and daughter Janie on the right. I believe the little figure in the very front is the son of Richard and Ellen Thomas. 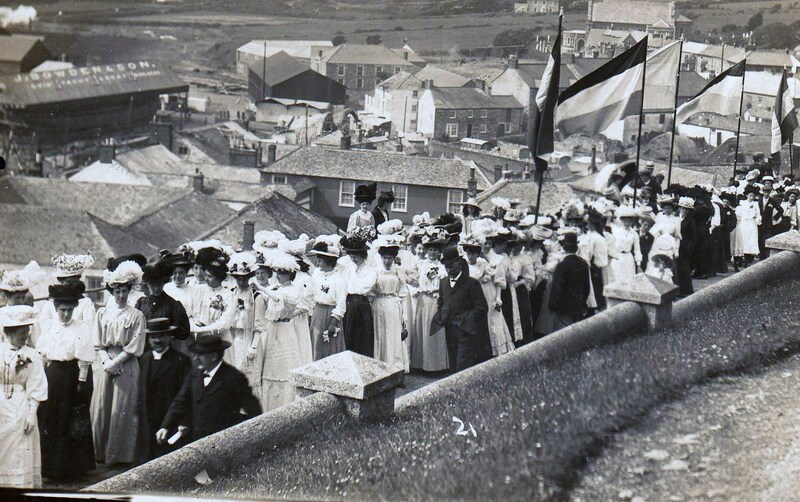 The launch of the "Lady Hilda" March 1909. In 1900 a large covered shed was built over the slipway to allow some protection for the shipwrights during the winter weather. But in the early 1900s there was a lack of building orders and both the main yards were in difficulty. In 1908 Jacky was pleased to receive an order from the Earl de la Warr for a fine new 75ft yacht to be named “Lady Hilda” after the Earl’s second wife. 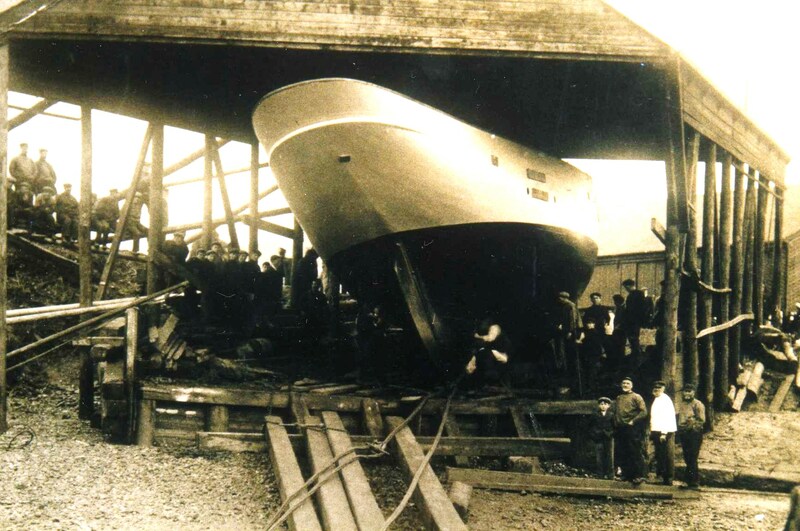 There were great celebrations at the launch of the yacht in March 1909, but by June the company had become insolvent. They struggled on for a period but then had to close and many local men were put out of work, including Thomas John Marshall, my grandfather. He looked further afield and eventually found a job as a shipwright in Devonport Dockyard and took his wife Hettie (nee Williams) and two sons: Jack and James (my father) to live in Torpoint. I was born there on 31st August 1929 and named after my grandfather. So my grandfather worked in Devonport Dockyard during the building of great battleships like HMS Lion, Centurion, Marlborough, the mighty Warspite, and the Royal Oak. As for Jacky and Elizabeth Ann’s other children: Margaret married Walter Trezise and Jane remained unmarried. George died in HMS Goliath in the Dardanelles during the First World War, and John Warwick married Dorcas Miners. 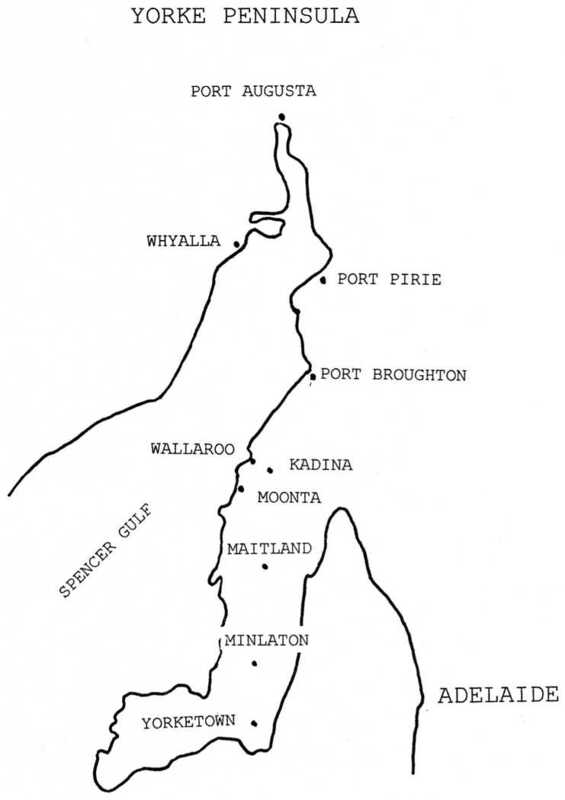 Thomas and Martha Bowden landed at Adelaide in South Australia and later moved north to Port Pirie at the northern end of Spencer Gulf. They bought some land and Thomas started building a timber mill and joinery shop, and the new company of T.Bowden, Timber Merchants was launched in 1883. 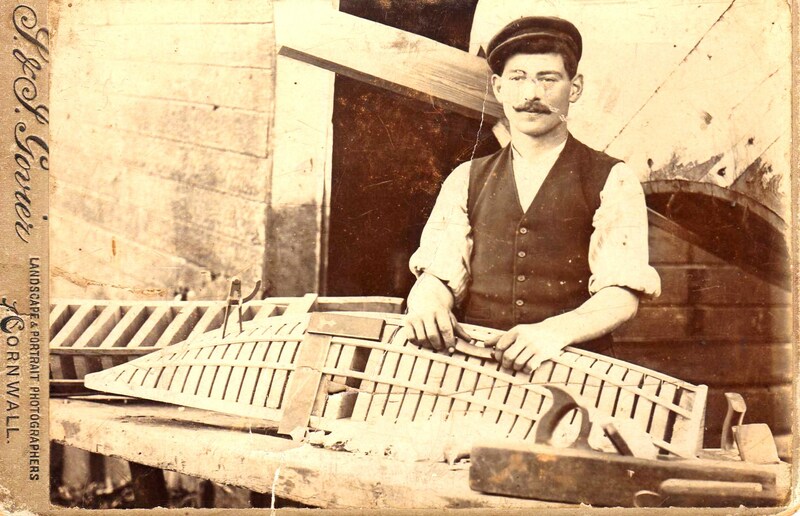 Soon they were building four-oared sliding seat racing boats which were very popular. Then the company was entrusted with the building of trunkways for the local ore carrying ships. His son Richard joined him in the business and they supplied most of the timber and materials for the many houses then being built in Port Pirie. Thomas Bowden died at the age of 77 during the Great Depression in 1930 and Richard then guided the firm through those difficult years. Richard married Doris May Freeman and their son, Tom, was born in 1919. He joined his father in the business in 1937 and when the 1939-45 War broke out Tom became an army engineer for the next five years. During this time Tom married Lottie Knauerhase. After the war Tom rejoined the firm and set about re-organising the firm to compete in the post-war boom. Richard died in 1959 at the age of 67 and Tom became the head of the company. 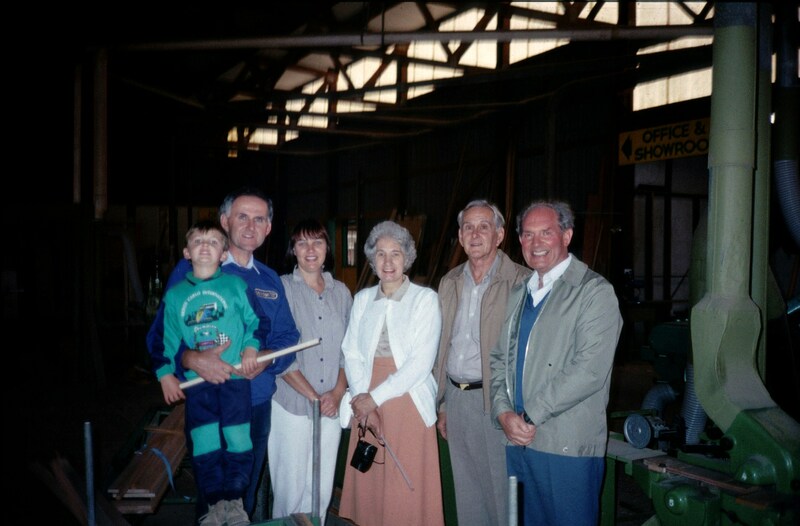 In 1966 son Peter joined Tom and in the next ten years the business premises were rebuilt and modernised. Tom retired in 1987 and Peter then carried on managing the company. 8.Tom’s son PeteTom's son Peter Bowden with son Josh and wife Pauline, Pam, my cousin Tom and me inside the Mill. 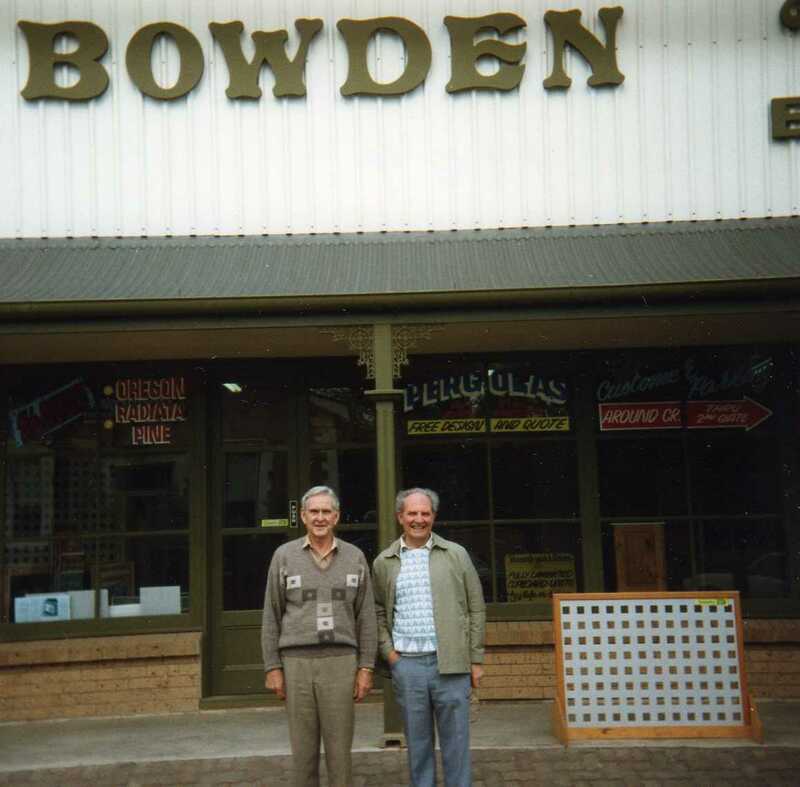 During my research into our family tree I became aware of the existence of another Tom Bowden in Australia. In fact there was a part of my family I had never met. So, belatedly, in 1986 I wrote to Mr Tom Bowden, in Port Pirie, South Australia and was delighted to get a reply and we have been corresponding regularly ever since. 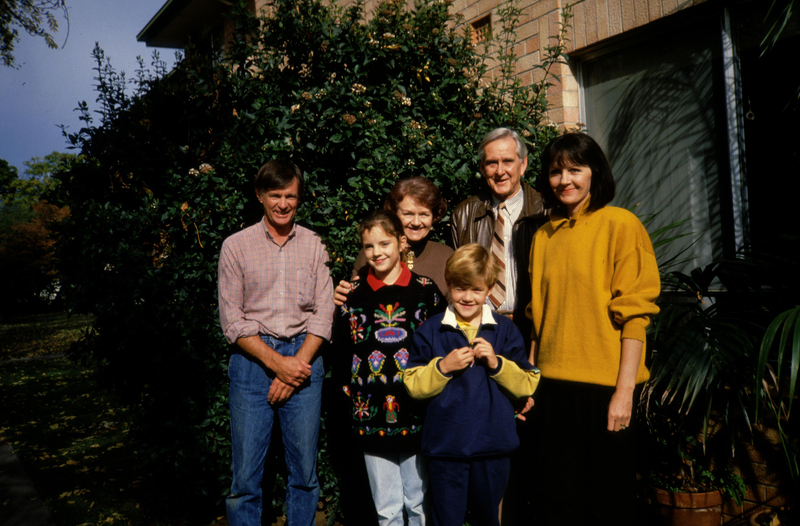 Don Sloan, Sarah Sloan, Lottie Bowden, Jonathan Sloan, Tom Bowden and daughter Marie Sloan in Adelaide. Tom and Lottie invited us to visit them and we decided to take up their offer. I happened to be Chairman of Bath Cornish Association at that time so we also decided to attend the 1989 “Kernewek Lowender” (Cornish Festival) in “Little Cornwall” South Australia, which is held during May on alternate years. So soon after I retired from working for the Navy, we went off to Australia and had a wonderful time. We received a lovely welcome from Tom and Lottie and their family: son Peter and daughter Marie and their families. Then we looked around Port Pirie and visited Port Augusta which is on the edge of the Outback the great desert in the centre of Australia. 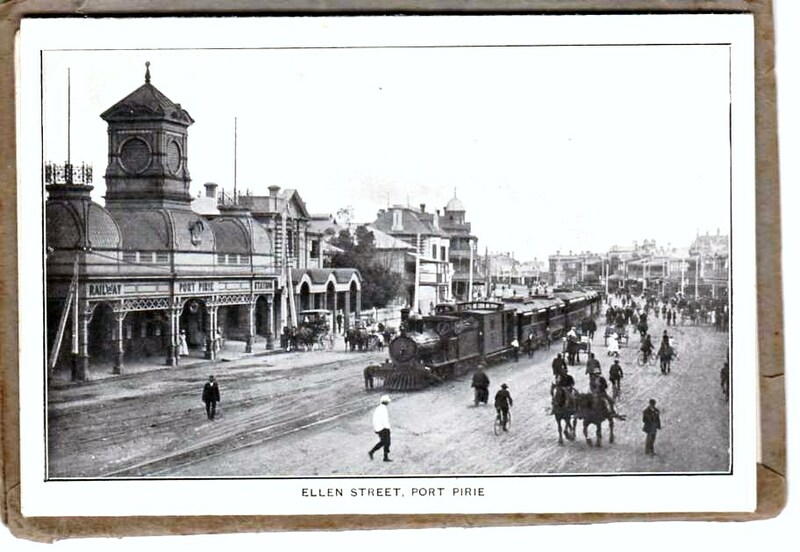 We then went to the Cornish Festival and returned to Port Pirie before touring around Australia with Tom and Lottie. 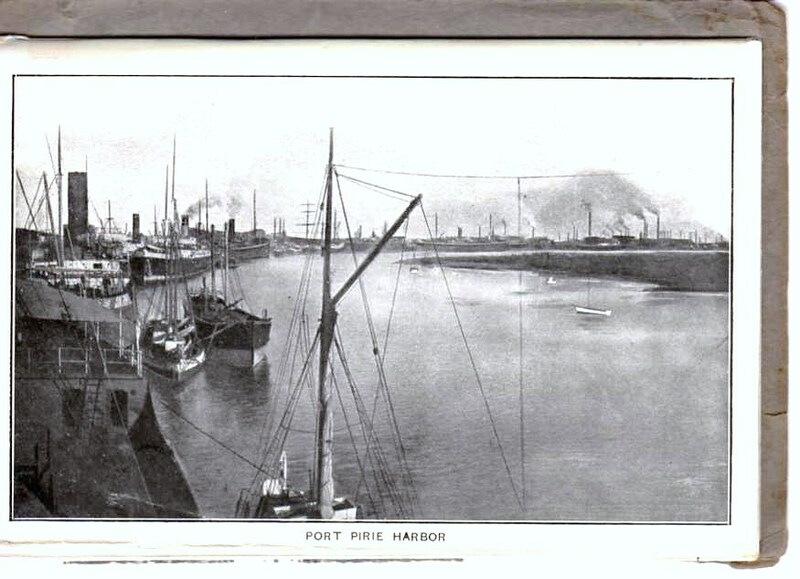 Port Pirie Harbour view looking towards the mouth of the river c.1900. Port Pirie is a provincial city in South Australia situated on the eastern side of Spencer Gulf near the impressive Flinders Range and 139 miles north of Adelaide. It has developed into a thriving port amid the mangrove swamps of the northern part of the gulf, and it got its name when the schooner “John Pirie” was the first ship to sail up the creek in 1846. Port Pirie is the nearest port to the rich silver-lead-zinc mines at Broken Hill in New South Wales and thousands of tons of concentrates arrive by rail each year for smelting in the world’s biggest lead smelters which was then named: The Broken Hill Associated Smelters Pty. Ltd. Their works are situated near the mouth of the river and there are many blast furnaces and tall chimneys, and the tallest is145ft high. Most of the lead, zinc and silver produced is shipped overseas from Port Pirie harbour. 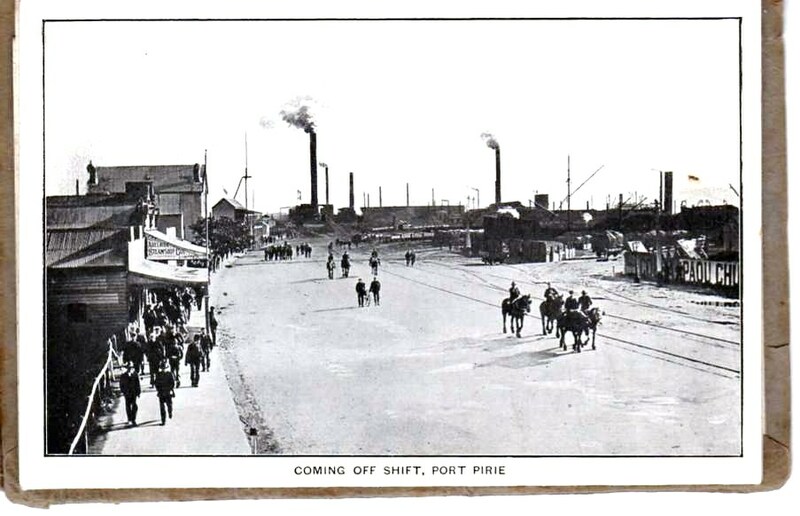 Workmen coming off shift from Port Pirie Smelters c. 1900. The farms in this area produce a great deal of wheat and barley and many thousands of tons of cereals are shipped each year from the Bulk Handling Terminal on the waterfront. Port Pirie is also well placed for major train and road transport links like: Sydney to Perth, Adelaide to Alice Springs, etc. When we were there in 1989 the population was about 14,000. Tom tells me there has been great development in the last 20 years so now Port Pirie has an increased population of about 17,000 and all the facilities you would expect to find in a small city. 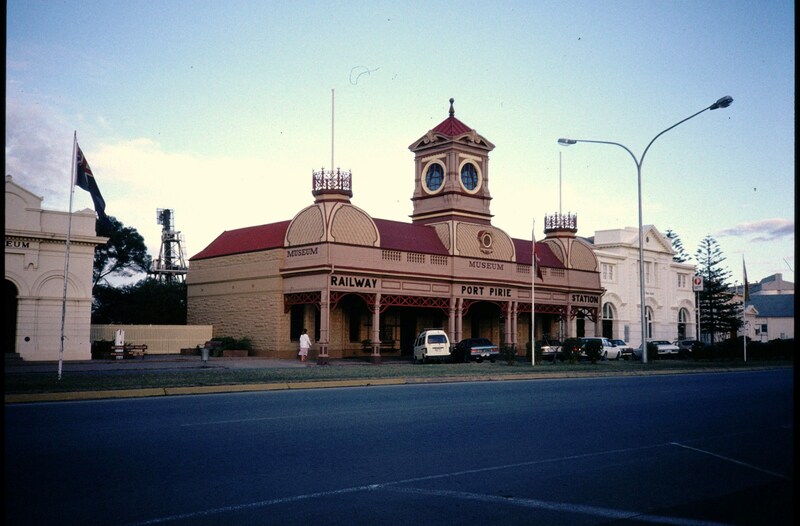 The Museum in Ellen Street, Port Pirie, May 1989, and this had been the Railway Station in about 1900. My illustrations showing some of the buildings in Port Pirie many years ago are intriguing and I like the large verandas and corrugated roofs. The view of the old railway station with a train in the main street is my favourite! It reminds me of the cowboy films I saw as a boy. Tom Bowden and his family must have had an interesting time when they first went there in 1883. It is now Christmas 2010 and things have moved on. I am now 81 and we still live in Bath and holiday in Porthleven every year, and I always stand on the quay and think about the old family boatbuilding business. Tom Bowden in Port Pirie is now 91 and his wife, Lottie, has passed away. The Bowden Timber Merchants encountered difficult times in recent years and closed in 2008 after over 120 years of business. Tom is now very busy playing his concertina or keyboard in a group who entertain at retirement homes, clubs and hospitals etc around the district. So this is where my story ends and I hope you have enjoyed this small fragment of Cornish family history. 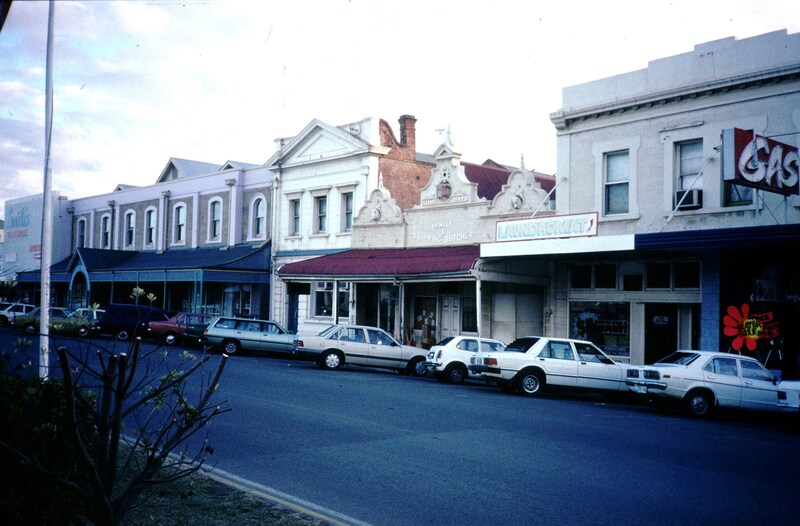 Across the road in Ellen Street, May 1989. The Railway Station in Ellen Street with a train in the middle of the street. c.1903! 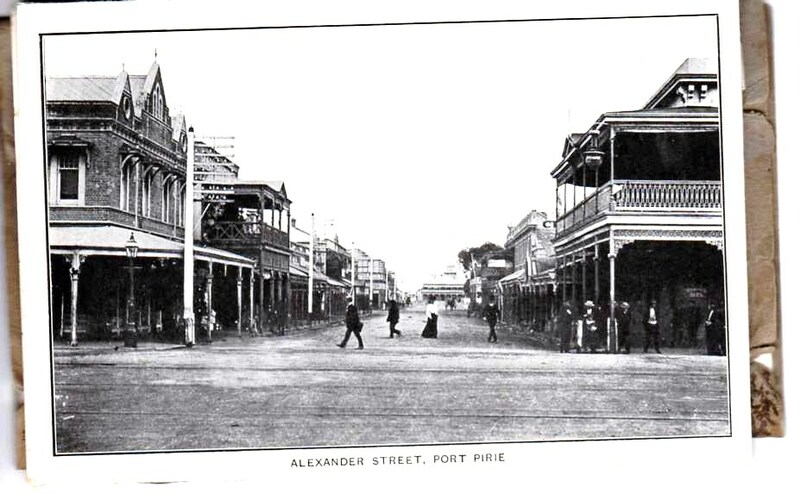 Alexander Street, Port Pirie, c. 1890.